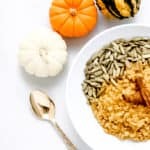 Pumpkin Pie Oatmeal via @shawsimpleswaps is the perfect blend of pumpkin, maple and sweet cinnamon to make this holiday season shine! Combine water and salt in medium stove top pan over high heat. Once water is boiling, lower heat and add in oats. Simmer, stirring occasionally for 10 minutes. After 5 minutes, whisk in vanilla extract, pumpkin puree, pumpkin pie spice, and maple syrup. Continue to cook 5 minutes until a majority of the water is absorbed. Remove from heat and let cool 5 minutes. When ready to eat, pour into a bowl. Top with pumpkin seeds or other desired garnish! Save leftovers in airtight containers for up to 5 days in the refrigerator or freeze for up to 3 months.